This film may be considered a classic today, but it was not appreciated in its time. In fact it was so expensive (and did not make enough back) that it marked the end or the downfall of a brilliant film maker. Fittingly, it's about the end of the old beautiful world (Paris in this case) and the rise of a modern world of boring buildings and sameness (there is a travel poster advertising trips to Mexico, England, and other places all showing a new building from their city, but the building looks exaclty the same as one of the plain looking, "modern" buildings across the street in Paris). In retrospect, this theme can be seen as a metaphor for Tati's career, and perhaps filmmaking as a whole. 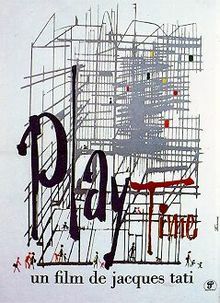 You couldn't make a film like "Playtime" today (and perhaps it shouldn't have been made in its time). Audiences simply wouldn't know how to watch it, and perhaps that's partly the reason for its failure in its original release. It doesn't really have a plot. It's basically a series of events; it's people experiencing the new "modern" Paris (the old Paris is only seen in reflections in the glass) and trying to fit into this new modern world, and we, the audience, are invited as spectators to witness these events. We see just about every scene from wide shots, as if we are in the room, and Tati doesn't zoom in for close ups, because if we were really there our eyes couldn't take us any closer then where we were sitting. And since we aren't cutting from close up to close up (or in and out) the scene is allowed to play out in long takes. The art of the long take is becoming a lost art these days. In many ways they are more difficult, because they require more rehearsal, more attention to detail and difficulty in timing. Considering the number of people that populate each scene and the fact that they are all busy with something, means that Tati had to give them all distinct directions. This all makes "Playtime" warrant multiple viewings to catch all the actions going on in any given scene. The direction (and editing) are very subtle, instead of directing our eyes and attention with camera moves, Tati directs our eyes with sounds that draw our attention, or colors (a character wears a brighter color to stand out against others in the frame), or even just glances from other characters. The result is a natural participation in the scenes as if you were sitting in the room observing just like the other characters. No one makes movies like this today. No one really experiments with the medium in this way. Certainly it's a gamble financially (a gamble that cost Tati a lot), but as a filmmaker, it has to be a dream to be able to try something different and break convention and do something truly unique. There are genuinely funny moments in the film as well. Tati's film persona Mr. Hulot, is tall with his trademark hat, overcoat and umbrella. In those days everyone knew Mr. Hulot, so Tati teases the audience at the beginning of the film by bringing in some fake Hulot's before the real Mr. Hulot is revealed. During the restaurant opening scene, a door man continually opens a large glass door for people entering and exiting, the door only visible by the large circular handle. When clumsy Mr. Hulot accidentally breaks the glass door, the door man fakes it to keep order by holding the circular door handle out and "opening" and "shutting" the now nonexistent door. The final scene where the tourists are leaving on their bus, stuck in traffic is made to look like an amusement park as cars go around the roundabout like a merry-go-round. The people on the bus are shown in the reflection of a piece of glass that tilts up and down giving the impression that the people on the bus are actually on a roller coaster. The film is recognized many years later as Tati's masterpiece. Even if today's audiences are used to lots of tracking shots and quick editing, this film is worth seeing, you just need to know what you're supposed to be watching.